The most astounding thing I ever witnessed on television involved not swords, dragons, or mother nature in HD widescreen, but a pencil. It happened in 1990, when CBS would air a yearly primetime special starring the magician David Copperfield. I recorded them all and still keep the VHS tapes in storage, despite no longer owning a VCR. Early ’90s Copperfield—his hair impossibly wide, as required by Vegas illusionists code—had just restored a sultry assistant after slicing her into nine pieces and now said he’d perform something more intimate. He requested a $100 bill from someone in the audience. Copperfield took a pencil (which would later prove to be normal and free of chicanery) and punctured its sharpened tip through the center of the bill. You clearly see it poking through. Then, with an audible rip, he tore the yellow No. 2 down the length of the bill. A stroke of Copperfield’s healing touch, and the $100 bill was unfolded and shown to be intact, void of holes or tears. The second phase was even more mind-boggling: He folded the bill into a V and rested the pencil inside. Slowly, one end of the pencil visibly melted through the paper. Just as quickly, the bill was unfolded and shown unscathed. My brain screamed, “Impossible.” I rewound and played back the segment a couple dozen times that night trying to make sense of it. 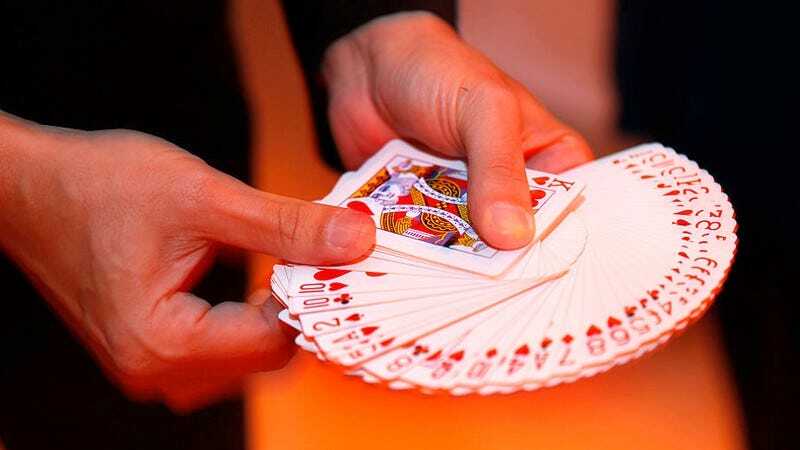 Since I was 4 and my parents took me to a department store with a kiosk selling “101 EZ Tricks” kits, I’d been enamored by the spectacle of magic—the stage illusions of ladies sawed in half, the manipulators producing an endless stream of cards from thin air. But that Copperfield pencil trick sent me down a rabbit hole, one that gets deeper each year. These days, I rarely buy new clothes, I no longer attend concerts or sporting events, and I’ve given notice to my longtime fantasy baseball league. All my expendable income now is spent on learning magic tricks. I savored working through individual tricks with playing cards in hand, but I also knew I wasn’t interested in pursuing magic professionally. What seduced me was the hit of cognitive dissonance every time a magic trick reached its denouement. Watching Copperfield melt a pencil through a bill created a pleasurable sensation in the mind—that irrefutable physical laws (solids don’t pass through solids) were not reconciling with what my eyes were witnessing. Here was the textbook definition of wonder. Card tricks also didn’t require the ostentatious theatrics of stage magic that a chubby and awkward 10-year-old could never pull off. One thing that sets magic apart is that while other hobbies are about the overt display of skills (yo-yo tricks, juggling, karate, piano), magic is about the concealment of skills, hiding sleight of hand within natural, unsuspicious movement so as to convince the spectator nothing untoward is happening. For this young Asian magic nerd, nothing sounded more ninja. There is, however, something ironic and tragic about obsessing over magic: The more you know its secrets, the less you experience those moments of cognitive dissonance. It’s the addict chasing after that first high that will never be equaled. It’s hard to turn the analytical brain off and not notice an Elmsley count done here, a diagonal palm shift there, rather than just watching magic as a layperson. Instead, we magicians try to bring some of that cognitive dissonance to others, and we begin to appreciate magic as a three-dimensional art form, and within it, discover its beautiful and devious nuances. There was something truly mystifying about that quarter vanishing, and the reason is that it was achieved with more than a sleight of hand technique. For the first time, I was fooling people not with what they saw, but with what their mind thought. What I did was use psychological gambits convincing the spectator that in their minds, the coin was absolutely going from the right hand into the left hand. Imagine if I said, “Star-spangled…” What’s the next word that comes to mind? Think of the French drop as the visual analog of that—the left hand reaches over and seemingly grasps the coin in such a way that your brain fills in the blanks. The physical action is convincing; there’s no logical place for the coin to go but inside the clasped hand. Many years later, I would understand that making a coin disappear without context isn’t so much an effect (the magician’s preferred term for a trick) as it is a puzzle. But I was an 11-year-old new kid, and the feeling that I could cause mini-explosions in the mind was dangerously addictive, as if suggesting I could control the Land Of Oz by pulling the levers behind this secret curtain. My interest continued to grow through high school: Every Saturday I worked at Market Magic Shop in Seattle’s Pike Place Market, pitching to tourists a trick pack called the Svengali deck (those of a certain age will know this as Marshall Brodien’s TV Magic Cards). The money I earned would’ve been spent on magic anyway, so I asked to be paid in books and videos. Soon, my bedroom accumulated hundreds of books and several suitcases filled with trick decks and plastic gimmickry. While friends displayed Austin Powers and Tommy Boy tapes on their entertainment consoles, I proudly stacked the complete collection of Michael Ammar’s Easy To Master Card Miracles next to my TV. Later, wherever I moved, whether for college or a job, two large boxes labeled “MAGIC” followed. Meanwhile, I brought exactly two button-up shirts for my summer newspaper internship. Magic yielded other revelations just as amazing; for example, witnessing the failings of our memories. I can’t tell you the number of times people would recount tricks I performed, but misremember certain details in ways that made the trick seem more impossible. I once had a friend write her name on a playing card, which disappeared from the pack and reappeared inside my shoe. To this day, she swears the signed card was found inside her shoe. Why correct her and ruin the single most perfect magic trick ever conceived, even if it never happened? As I’ve grown into the third decade of my hobby, what’s now fulfilling is understanding my motivation for learning and performing magic. It wasn’t about entertaining or fooling people. I enjoyed magic as an intellectual challenge: posing something that appeared impossible and working out a logical, surreptitious method to make it so. How can you take a normal pencil and make it appear to melt through a $100 bill? There was a way to accomplish it, there were ways of making the illusion realistic, and armed with this knowledge, soon I was astonishing people with this trick, just as Copperfield did me. Recently, I began reading Preserving Mystery, a collection of essays on magic theory and history by the author-performer Jamy Ian Swiss. (His profiles paying tribute to his magic heroes are at present my favorite thing on the internet.) Near the end of his book was a chapter titled “On The French Drop.” Whoa. I thought I had put in my 10,000 hours and understood all I needed to know about this rudimentary coin sleight. But for the next 11 pages, Swiss tore both preconceptions and present-day conceptions into shreds, all for a move that takes half a second to perform. I’m currently on my fifth reread of the French drop chapter, and every time, it’s a fresh hit of cerebral pleasure. This is the reward now: the unearthing of discoveries over a lifetime of obsession. There’s always more to be found.